Couples are always looking for new and exciting ways to make their wedding day memories stand out. One of the hottest trends on the photography front is actually quite old, which is to capture special moments of the day from high in the sky. In the 21st century, drone photography can perfectly capture the grandeur of this special occasion. And it’s a lot cheaper than a hot air balloon. Hiring a professional aerial photographer offers the opportunity to capture both still shots and video in cinematic quality. 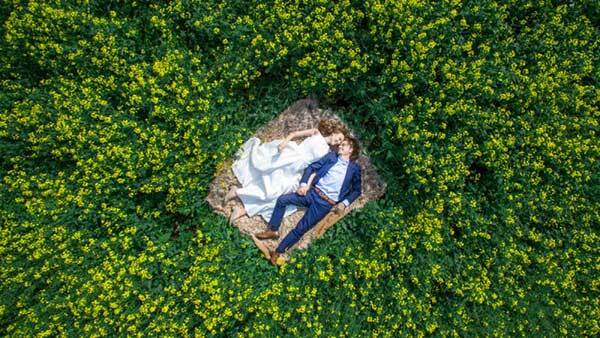 Drone footage can complement rather than replace classic wedding photography, offering a unique perspective to stand alongside more traditional shots. A couple may well have a budding amateur friend offering to fly their drone, but would be well advised to opt for a professional instead. With the risk of collision damage, couples should look for a professional who is compliant with safety standards, necessary permissions, and carries the appropriate insurance. A professional will establish if drones are allowed in the area and what restrictions apply. The bungling amateur may well end up flying their drone on a collision course with the mother-of-the- bride’s hat. Another advantage of engaging the services of a professional aerial photographer is the pictures will be professionally edited. Drones come into their own for panoramic outdoor shots. They can be used indoors if the venue has very high ceilings, but as the noise factor can be an irritant they are best used outside. One of the most popular shots captured by drones is the bride walking down the aisle, but again, because of the noise, the drone should be decommissioned when the vows are exchanged. One other factor to consider is the weather as drones cannot be operated in rain, snow or wind. Last minute inclement weather may result in a drone shoot being cancelled. When it comes to selecting a professional aerial photographer, couples should browse through the photographer’s portfolio and discuss any particular shots they would like to arrange in advance. 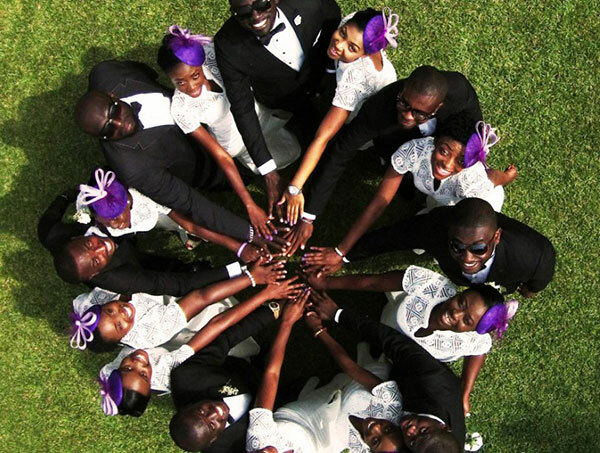 Popular images are aerial views of all the guests together, and couples can arrange for something unique such as having all the guests standing to form a heart shape or spelling out the couple’s initials. Shots taken of the most special moments can be edited together in video format. Drone photography is an amazing addition for destination weddings as footage of the happy couple can be woven into a video shoot of the exotic location, panning out to incorporate breathtaking scenery. 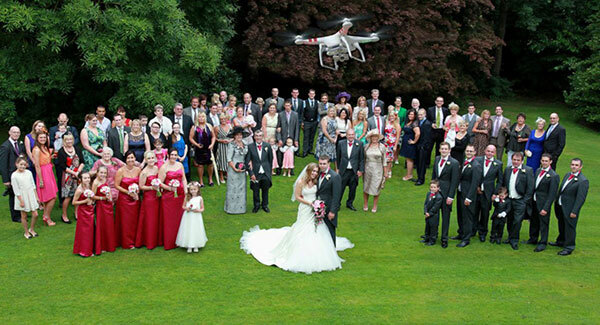 Hiring a professional aerial photographer can be an extravagance worth including in the wedding budget. It will provide a talking point as the camera is remotely operated above the guests’ heads and offers candid shots as it is less intrusive for the camera shy than being posed by a photographer. Drone footage offers a unique and dramatic perspective that takes the wedding photographs and video to a whole new level. For couples wishing to capture the magic of their wedding from a truly unique angle, drone wedding photography promises cinematic vistas, dramatic shots, and adds an extra frisson of excitement to the celebration. Aerial shots of this once in a lifetime moment are something unique to treasure.